- Invalid attribute '(1,1,1)' ignored. - Invalid attribute '(1,0.7,0.7)' ignored. - Invalid attribute '(1,1,0.7)' ignored. - Invalid attribute '(0.6,1,0.6)' ignored. - Invalid attribute '(0.7,1,0.7)' ignored. - Invalid attribute '(0.8,1,0.8)' ignored. ปะการังทาบูเลต (ซายริงโกพอริด) ในหินปูนบูนยุคคาร์บอนิเฟอรัสตอนล่าง ใกล้กับเมืองไฮวาสส์ รัฐอาคันซอ มาตราส่วนแท่งยาว 2.0 ซม. ↑ Barnes, R.D. (1987). Invertebrate Zoology; Fifth Edition. Orlando, FL, USA: Harcourt Brace Jovanovich, Inc. pp. 149–163. ↑ Sumich, J. L. (1996). An Introduction to the Biology of Marine Life; Sixth Edition. Dubuque, IA, USA: Wm. C. Brown. pp. 255–269. ↑ "Anatomy of Coral". Marine Reef. สืบค้นเมื่อ 2006-03-31. ↑ W. W. Toller, R. Rowan and N. Knowlton (2001). "Repopulation of Zooxanthellae in the Caribbean Corals Montastraea annularis and M. faveolata following Experimental and Disease-Associated Bleaching". The Biological Bulletin. 201: 360–373. doi:10.2307/1543614. PMID 11751248. ↑ 9.0 9.1 9.2 9.3 9.4 Veron, J.E.N. (2000). Corals of the World. Vol 3 (3rd ed.). Australia: Australian Institute of Marine Sciences and CRR Qld Pty Ltd. ISBN 0-64232-236-8. ↑ 10.0 10.1 Barnes, R. and R. Hughes (1999). An Introduction to Marine Ecology (3rd ed.). Malden, MA: Blackwell Science, Inc. pp. 117–141. ISBN 0-86542-834-4. ↑ 11.0 11.1 Jones, O.A. and R. Endean. (1973). Biology and Geology of Coral Reefs. New York, USA: Harcourt Brace Jovanovich. pp. 205–245. ISBN 0-12-389602-9. ↑ Ben M. Waggoner (2000). David Smith and Allen Collins, ed. "Anthozoa: Fossil Record". 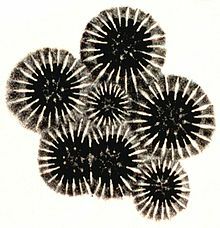 Anthozoa. UCMP. สืบค้นเมื่อ 2009-03-23. ↑ William A. Oliver, Jr. (2003). "Corals: Table 1". Fossil Groups. USGS. สืบค้นเมื่อ 2009-03-23. Microdocs: What is a coral? หน้านี้แก้ไขล่าสุดเมื่อวันที่ 27 พฤศจิกายน 2561 เวลา 15:54 น.